Previously owned. We sent this timepiece to Hublot to be fully serviced and polished and received it back in December 2015. Crown was replaced. One tiny, almost invisible chip above K and O in Hong Kong on very edge of crystal. Use zoom function. It is so small that Hublot didn't recommend that we replace the crystal. Watch comes in Hublot case. -- 48mm black ceramic, rubber and brushed finish 18k rose gold case. Bezel has time for Moscow, Bangkok, Hong Kong, Los Angeles, Aspen, and Santiago. -- Black dial with rose gold hour and minute hands. 4 rotating discs show time in London, Karachi, Tokyo, Auckland, Anchor, and New York. 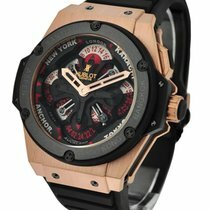 -- Black rubber Hublot strap with black PVD titanium deployant clasp with brushed finish 18k rose gold buckle.